If it was easy, everyone would do it as the saying goes. Achieving great overall equipment effectiveness with your vertical form fill and seal equipment isn't necessarily easy - but it's not complicated. It simply takes a commitment, consistent observation and data capture, and an open mind when it comes to finding the opportunities for improvement. But where do you start? Good question - and the one that's often asked, particularly in small and mid size companies where there isn't a whole staff back at corporate HQ to help. And that's exactly what this handy guide provides - the starting point and step-by-step playbook so that every operation can implement the same sort of rigorous OEE improvement process that the multinationals rely on for their competitive edge. We've even included a quick section on how to incorporate some of the lessons you'll learn into your next machine procurement project. If you're looking for a home run, this probably isn't it. But if you'd like to step-by-step improve each aspect of vertical bagging that is a source of inefficiency - filling, sealing, changeovers, film changes and follow on packaging - then download this free guide. Not only does it explain the premise and process of OEE, but it provides handy checklists, data logging forms and even includes an option for you to get a monthly reminder that it's time to capture some more data to make sure you're improving...or at least not slipping. Imagine - no 3rd shift or weekend calls. OK, the guide isn't magic, we can't promise that. 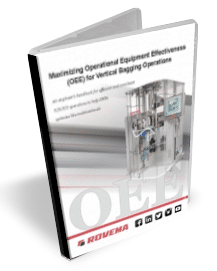 But we're pretty confident that you'll find everything you need to get started and build a world class OEE program for your vertical bagging operation. Grab your copy today by submitting the quick form on this page.